This hymn by Frances Havergal is perhaps one of the most beautiful hymns you've (probably) never sung before. As the title suggests, it emphasizes our dependence on Jesus (and His adequacy for all that we need). A day as black as this one deserves to be remembered. If we can remember December 7, 1941 as a day that will live in infamy because of the 2402 killed; if September 11, 2001 remains forever solemn because of the 2996 who died, then January 22, 1973 will forever stand as a day of horror. Even after abortion is abolished and our descendants look back upon us with as much disgust as we do upon southern slaveowners, January 22nd will still be a day of mourning. On this day, over 55 million Americans, a disproportionate number of them black and Downs syndrome babies, were sentenced to death. Ultimately, the answer is evangelism. A true Christian can never knowingly kill a child, but a non-Christian does not know the love of God found in Jesus, and has not His strength to love inconvenient and unplanned children. Call to Worship: And Can It Be? In recent weeks my parents and I have begun singing a hymn or two together before we go to bed. It's been good for both our relationship with the Lord and with each other. In that spirit, I'm hoping to start posting a link to a hymn on my blog each week. I intend to post them on Mondays, as a reminder to us all that worship is meant to fill and control our entire schedule, not just Sundays. Here for this week is a hymn that is one of Dad's favorites. Prayer draws its very life from the Bible and has no standing ground outside of the warrant of the Scriptures. Its very existence and character is dependent on revelation made by God to man in his holy Word. Prayer, in turn, exalts this same revelation and turns men toward that Word. The nature, necessity, and all-comprehending character of prayer is based on the Word of God. The prayer that is born of meditation upon the Word of God is the prayer that soars upward most easily to God’s listening ear. So I love this author's idea: printing all of the prayers of the Bible, organized in categories. But the way he organized and presented them seems a bit cumbersome to me. He gives a potpourri of personal advice and quotations from famous Christians about prayer (including the two I printed above). They are helpful and succinct, but not particularly organized or thorough. Then, for the Bible prayers themselves, he gives a rather unhelpful analysis of the number of times each word is used in a prayer. What use is it to know that the fifth most common word used in a Bible prayer is "in"? But on the whole, this is a good book, based on a great truth. I pray it prompts more Christians to find and use the prayers of the Bible as their own starting points for communication with God. Note: I got this book for free from BookSneeze.com in exchange for writing an unbiased review. A friend forwarded this story to me and I found it thought provoking. One day while the class was in the lab, the professor noticed one young man, an exchange student, who kept rubbing his back and stretching as if his back hurt. The professor asked the young man what was the matter. The student told him he had a bullet lodged in his back. He had been shot while fighting communists in his native country who were trying to overthrow his country's government and install a new communist regime. In the midst of his story, he looked at the professor and asked a strange question. He asked: "Do you know how to catch wild pigs?" The professor thought it was a joke and asked for the punch line. The young man said that it was no joke. "You catch wild pigs by finding a suitable place in the woods and putting corn on the ground. The pigs find it and begin to come every day to eat the free corn. When they are used to coming every day, you put a fence down one side of the place where they are used to coming. When they get used to the fence, they begin to eat the corn again and you put up another side of the fence. They get used to that and start to eat again. You continue until you have all four sides of the fence up with a gate in the last side. The pigs, which are used to the free corn, start to come through the gate to eat that free corn again. You then slam the gate on them and catch the whole herd. Suddenly the wild pigs have lost their freedom. They run around and around inside the fence, but they are caught. Soon they go back to eating the free corn. They are so used to it that they have forgotten how to forage in the woods for themselves, so they accept their captivity." The young man then told the professor that is exactly what he sees happening in America. The government keeps pushing us toward Communism/Socialism and keeps spreading the free corn out in the form of programs such as supplemental income, tax exemptions, dairy subsidies, payments not to plant crops (CRP), welfare, medicine, drugs, etc., while we continually lose our freedoms, just a little at a time. This book is a rare hybrid. 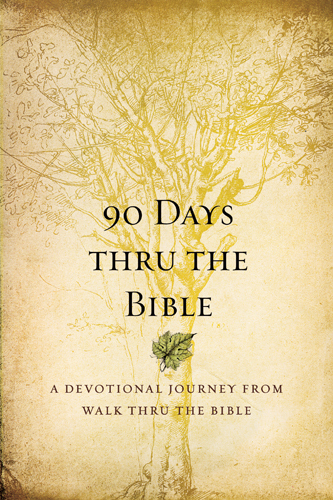 It is a 90 day devotional -- nothing uncommon about that. And it is a Bible overview (again, nothing unusual -- most study Bible contain book introductions). But the marriage of devotional to Bible overview is a surprisingly challenging relationship. No wonder that so few attempt it. It leads to proportions that seem strange: single-chapter Philemon gets the same amount of time (one day) that 34-chapter Deuteronomy does. Some stories get entirely passed over. And how can you adequately cover 150 Psalms in 5 days? It gives us less facts about the arrangement and relationship of the pieces of the Bible than we would expect from an overview, and less application than we would expect from a devotional. There is no bait from humorous stories, poems, or pithy statements like "Our Daily Bread" includes. No pictures or charts. But in a day when we have grown accustomed to adding spices to the Bible before we'll eat it, this book is a refreshing attempt to demonstrate that the Bible can stand alone as tasty and perfectly nourishing meal. To continue the food analogy, some authors can teach you how to properly "cook" the Bible for yourself, while others provide TV dinners. But this book is something like a prepared salad: fast, but healthy. It requires chewing. Congratulations to the author, Chris Tiegreen of Walk Thru the Bible, for achieving such a rare balance. I got this book for free from Tyndale's Blog Network in exchange for writing this review, but my review was not required to be positive.